Four weeks into the New Year, and while I am on pace with the work schedule I set for myself, I am also struggling with my current project. Creativity is not always something one can force, and right now I am trying to make myself come up with ideas for two new books. Why? I need to get in proposals to my publisher so that I can get to work on the projects, and in today’s market that means writing up proposals and synopses, regardless of how many books I have written and published in the past. I might even need to submit a few chapters of the next book along with the proposals. That’s fine. I have no problem with that. What’s giving me fits is trying to come up with the new ideas. I know the general outlines of what I want to write. I know where the books fit in with the larger chronology of the project, but beyond that . . . well, I’ve got nothin’. I have been here before, and I know I’ll get through it. The ideas will come. But right now, its a struggle. We were in Wollongong, New South Wales, for Australia Day in 2006, and it remains one of my most vivid memories from our year in Australia. It was a great day — heaps of fun. Amusement park rides and a crafts fair at the waterfront, good food, some interesting entertainment, and then, once the sun went down, a spectacular fireworks display supplemented by fire-eaters and people juggling torches. It was reminiscent of Fourth of July celebrations here in the States, and yet it was thoroughly Australian and different from anything I’d experienced before. Wonderful times. To all of my friends Down Under, Happy Australia Day! Hope it’s a great one! Today’s post can be found at http://magicalwords.net, the group blog on the business and craft of writing fantasy that I maintain with fellow authors Faith Hunter, Misty Massey, A.J. Hartley, C.E. Murphy, and Kalayna Price, among others. The post is called “On Writing: What Are We Good At? What Can We Improve,” and it’s about assessing honestly the strengths and shortcomings of our writing. I hope you enjoy it. 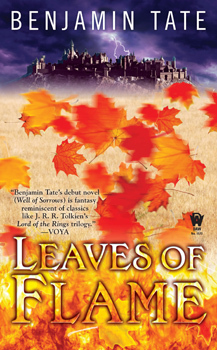 My good friend Joshua Palmatier, who also writes as Benjamin Tate, has a new book out called Leaves of Flame, a follow-up to his critically acclaimed series opener, Well of Sorrows. I have to admit that I have not yet read the book, but I can tell you that Joshua/Benjamin is a) an excellent writer, b) one of the nicest people you could ever want to meet, and c) also a terrific editor. (I worked with him and Patricia Bray on their anthology After Hours: Tales from the Ur-Bar.) Joshua recently posted an essay at the Magical Words blog site about the magic system he developed for his series. I urge you to read it. It will whet your appetite for these books. Today’s post can be found at http://magicalwords.net, the group blog on the business and craft of writing fantasy that I maintain with fellow authors Faith Hunter, Misty Massey, A.J. Hartley, C.E. Murphy, and Kalayna Price, among others. The post is called “On Writing: The Value of Ambition,” and it’s about different sorts of ambition and how they influence our writing. I hope you enjoy it.